Wisdom says the fears of the wicked will all come true, as will the hopes of the godly (Proverbs 10:24). During occasions of disaster and tragedy such as have impacted us on the East Coast recently, it feels as if this promise of a reconciled future is far off or perhaps will never be fulfilled. In this season of Advent we have found waiting difficult. Our recent storms have begged us to consider our foundation. The Statue of Liberty, tempest tost in the New York Harbor by Hurricane Sandy, survived with her recently refurbished crown intact but her footing unsure due to the destruction of much of Liberty Island’s infrastructure. It appears the base on which Lady Liberty stands is crumbling and we all feel it. Liberty herself has joined in our tension filled anticipation, looking out maternally over a devastated region. We attempt to take solace at this time in remembering another Mother awaiting a Savior. Sandy followed on the heels of Hurricane Irene. These sisters of devastation swept homes into the sea, capsized businesses, knocked out lights, crippled public transportation and claimed lives. Their forceful winds and waves of destruction laid bare a power crisis leaving at least 8 million of us in the dark, some for weeks, while provoking deeper questions of the meaning of power. Inevitably, an uproar of attention and assistance follows when people who are used to being in power lose it. In the aftermath of the storms, neighbors expressed concern for each other who had lost their power. Utility company crews worked through the night to restore power. Electricians arrived from across the country for the benefit of the powerless. In real time we observed the connection between power and resources in our culture. And when any who are in trouble are embraced with love and helping hands it awakens hope and gratitude. Here in Connecticut, Sandy may have spared us the difficulty experienced by those in New York and New Jersey, but we are the epicenter of pain this week after losing 27 lives in the second deadliest school shooting in our nation’s history. With 20 of the victims lost children ages 6 and 7, no sense will be made of this tragedy. No understanding of motive or gun-control debates will bring them back to celebrate Christmas with their families. Their wrapped gifts under the tree will remain forever unopened. We can only hold each other and our heads in mourning, crying out to God on behalf of their innocent blood spilt, for their parents’ unspeakable grief. We attempt to take comfort in remembering another Father in anguish over His innocent Son murdered. We pray again that the hopes of the Godly are realized and that our waiting is not in vain. Today heartfelt prayers and gestures of support are overflowing for those directly affected by the catastrophe at Sandy Hook Elementary School. Rightfully so. Let us not forget each of these little souls stolen from us as well as the teachers and staff who courageously served them on a daily basis before being forced to make the ultimate sacrifice of a friend. Kind words and acts of love directed toward Newtown recreate faith in the goodness of humanity. Yet we know the people of Newtown, Connecticut are not the only ones hurting in our country. If we have eyes to see, other innocent victims come into view, souls somehow considered more tolerable casualties. Their executions carried out at a slower pace, but alarmingly steady. Not simultaneously and with no media fanfare. Rarely are the continually oppressed recipients of such widespread goodwill and generosity. Somehow viewed as acceptable victims, they are not aware they too have a voice, frequently occupied with more basic needs such as simply surviving off limited finances and inadequate education. Standing up for one’s rights often takes a backseat to drowning out harsh realities through self-injurious actions which can lead to generational imprisonment. We ask who is intent on restoring power and equality of opportunity and justice to these brothers and sisters? These acceptable victims include our people of all ages who are continually losing their lives in the senseless violence occurring in our inner cities. For over a decade and a half, Sacred Heart Church in Camden, New Jersey has held a remembrance service on the last Sunday of the liturgical year to honor those murdered in their neighborhoods and offer comfort to their families. This year Sacred Heart read aloud the names of an unfathomable 63 human beings murdered between November 2011 and November 2012. Greater than one a week in a city of only 77,000 residents. The vast majority from gun violence, but not all. In September, a six year old boy named Dominick Andujar had his throat slashed when he tried to come to the rescue of his older sister who was being sexually assaulted. Days prior in August, a two year old boy named Zahree Thomas was decapitated, his head found in a freezer. It may be because these stories are too hard to for us to hear that they are not more widely circulated and that we are not more adamantly outraged and driven to action. But Sandy Hook has proven this untrue, leaving us to wonder why we have normalized the tragedies occurring in Camden, the poorest per capita city in the United States. In part, our collective despair for Connecticut or Colorado seems to be a communal lamentation for the loss of the “safe place” in our culture realizing that Sandy Hook could have been the neighborhood school our kids attend or Century 16 in Aurora the local movie theater we frequent. We want to shield our own children from danger and harm and now realize that we cannot guarantee their safety. We have not understood that in failing to see ourselves in places like Camden, we have created a false narrative of us versus them. We have forgotten Dr.King’s proclamation that “whatever affects one directly affects all indirectly”, ignoring the nightmares experienced by our brethren, now shocked when evil has attacked here as well. We are afraid yes. But now is not the time to shrink back from our public places or rush to homeschool all of our children. If we run away from evil, it will find us. Neither can we escalate the myth of redemptive violence or its hateful rhetoric looking for a scapegoat. We must confront evil in sacrificial love as many of the teachers did in this latest tragedy, saving the lives of students as a result. We remember a Parent who willingly entered into our distress and in so doing lost His Son, and believe this is the Way forward, that good can overcome evil. We now grieve our loss of those whom the world was not worthy at Sandy Hook Elementary. But let us grieve all our lost sons and daughters and their dreams massacred. Let us support each other through these storms, physical and mental, regardless of geography and access to power. Let us continue to wait together expectantly and actively for the Prince of Peace, hoping that in finality our chains will lay broken at our feet and that our tired, poor and huddled masses will one day breathe free on solid ground. In our fear and brokenness we trust that the fears of the wicked will all come true, as will the hopes of the godly. Thank you for your continued prayers. In November 2009, I was blessed with an opportunity to participate in a weekend-long “School for Conversion” hosted by the New Monastic communities in Philadelphia, PA and Camden, NJ. I had learned about the communities through reading Shane Claiborne’s “Irresistible Revolution” in 2006 and desired an opportunity to interact with and learn from the folks there from that point on. My hope was made tangible for three days last November, when I saw to a great extent what it looks like to actually live out the Good News of Christ. The entire weekend was, and continues to be, formative for us as we develop our orthodoxy and orthopraxis for church planting. But, especially moving was the capstone of the weekend; attending Mass at the Sacred Heart Parish in Camden on November 22, 2009, which marked the last Sunday in the church calendar. Never having been to a Catholic Mass, aside from weddings and wakes, I was struck by this church’s passion for shining the light of Christ in the darkest parts of their city and their eagerness to do so as a part of their Sunday Mass. As the following Sunday would mark the beginning of Advent (the Christian season of expectation and anticipation in preparation for the coming of Christ) and a new year for the church, Sacred Heart chooses to use the final Sunday of the liturgical year to remember all of those who have been murdered in the city of Camden over the previous year. During the service, I learned 37 people had been murdered in Camden from November 23, 2008 through November 22, 2009. Sacred Heart’s pastor of over thirty years, Father Michael Doyle, read the name of each one of the victims aloud, followed by their age and cause of death. Each name called was met by a family member of the deceased, with their loved one’s name around their neck and a candle in hand. As the family member walked forward, the Easter Candle lit their own and they remained standing at the front of the church. For victims without family present, a surrogate family member was appointed by the church and they too would walk forward, light the candle of remembrance and stand up front. The majority of the relatives who had lost someone to a violent death were not members of the church, but were present this Sunday because of the church’s invitation to remember and honor their brothers and sisters. I vividly recall how badly my heart wanted to shut down and stop empathizing with the families as the pain felt too great. I could only listen to three or four names called consecutively before beginning to weep. I would then block out the next few names out of necessity, before forcing my spirit open to become present again in the shared suffering. Particularly grievous were the names of the teenagers killed by gun violence and the names of the women and one elderly man whose lives were prematurely ended by violent beatings. The sight of those 37 people with lit candles silently and visually embodying the dead is an image seared in my mind. I decided then I would pray for the city of Camden faithfully over the next year and specifically that the number of murders would be less in 2010. I prayed every day upon returning home. For about a week and a half. Then the Holidays preoccupied my time and my petitions to God became increasingly more sporadic until my Camden experience grew further away and my passionate prayers flickered out. Over this past summer, I began praying again as I relayed my experience at Sacred Heart last Fall to a brother in Christ and we spoke about the possibility of meeting up in Camden in November 2010 to expose our own families to the spiritual and physical realities of the city hoping to again light the fire. Jaime was on board as she had sacrificed to allow me to go to Camden last year and had not had a chance to experience the beauty of God’s work in Camden. We decided we would bring the kids, despite the anticipated eight hour round trip drive. I contacted the incredible family I stayed with in 2009, who live across from Sacred Heart in Camden, and they confirmed that the church would again be facilitating their annual candle lighting ceremony on November 21, 2010. We got up at 5:30 am on the morning of the 21st, packed the kids in the car and made good time on our morning commute, arriving in Camden in just over three hours as traffic was nearly non-existent on this Sunday before Thanksgiving. 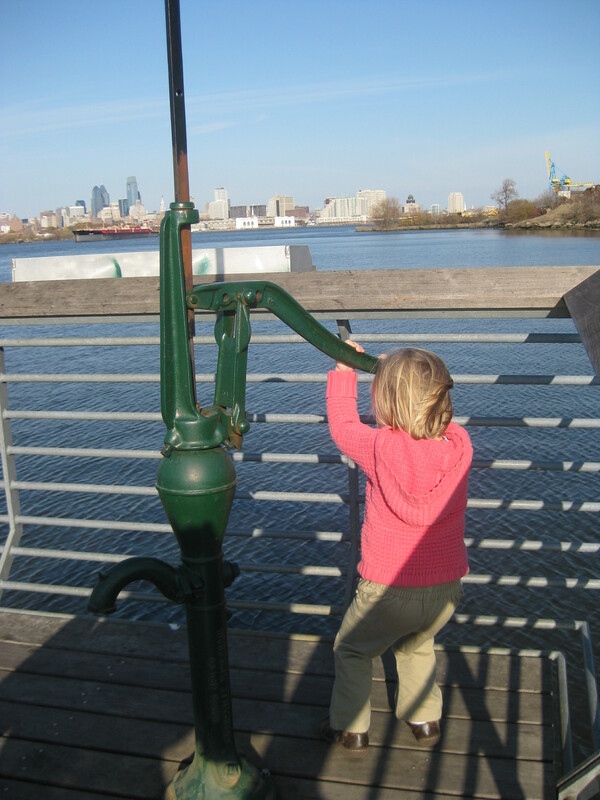 Since we arrived ahead of schedule, we stopped at a little park on the Delaware River with a view of the Philadelphia skyline and let the kids get some energy out before church. Both kids had a great time running up and down the fishing pier where a water pump was discovered and utilized to bring up mucky river water endangering all church outfits. We checked in with our friends Timothy and Cheryl and their 17 month old daughter, the inspiring Mennonite family who were my gracious hosts last Fall, and then we embarked on a walk around the block before church. We stopped by the Poet’s Walk on Jasper Street where a small brick alleyway has been laid bearing the names of beloved authors and poets. In the center of the small courtyard stands an elevated millstone containing an actual brick from James Joyce’s home in Ireland. The piece is a part of the James Joyce Seats of Learning project which plans to place 63 small monuments incorporating a brick from Joyce’s home in public locations all over the world. 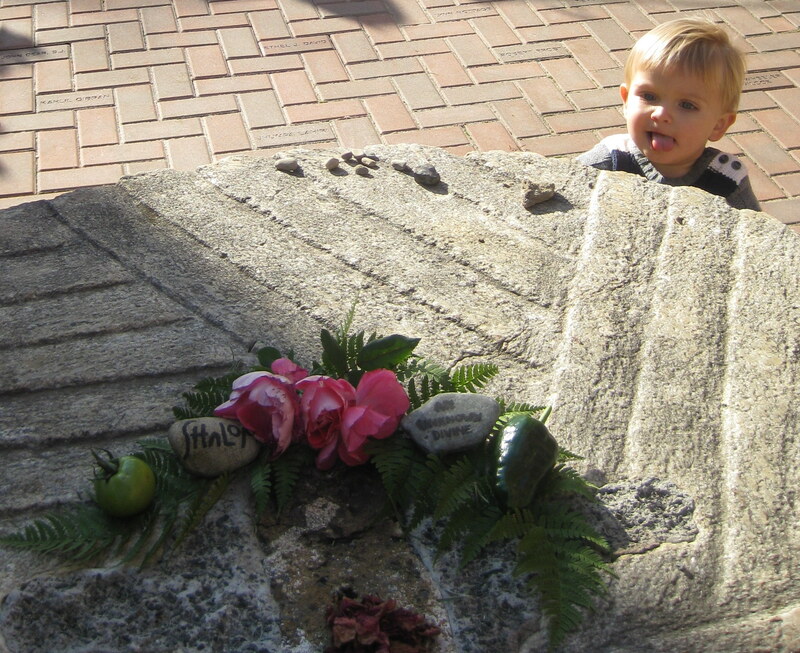 I was particularly endeared to a small rock on the millstone on which “Shalom” was inscribed, proclaiming for all the neighborhood God’s conciliatory work of recovery and restoration occurring in Camden. Though the American Empire has largely abandoned Camden, God’s presence is felt here in the community gardens and outdoor frescoes created by His church and intentional communities of His people. A people committed to being active in God’s present Kingdom, the light meeting the dark. Shepard makes his own rock contribution to the James Joyce Seat of Learning in Camden. We then headed over to Sacred Heart to the alarm of at least one parishioner who saw Jaime, 31 weeks pregnant at the time, and feared we had mistakenly come to visit a week early as the first Sunday of Advent is reserved for the blessing of expectant mothers. Quite a different experience and service from the heartbreaking goodbyes to the deceased we were about to experience. We assured the young usher that we knew what we were in for and found seats as well as some familiar faces from last year’s service. Father Doyle opened the Mass by noting that this past liturgical year saw 38 murders in Camden, an increase of one over last year, as two more victims were tragically murdered in just the previous week. Father Doyle expounded upon the injustice in Camden, reporting that in 2010 thus far, London, a city of 7.7. million, has recorded 11 murders, while Camden, population 79,000 has a death toll of 34. The vast majority of Camden murders are a result of gun violence as the tough New Jersey firearms laws are superseded by the ease in which handguns can be purchased in bulk in Philadelphia and trafficked into Camden just across the river. An annual study released by the CQ Press perennially lists Camden among the most dangerous cities in the United States, topping the list in 2003, 2004 and 2008. The 2010 list, released on the day of our visit, cited Camden as the second most dangerous city in the US over the past year based on FBI crime statistics tracking the number of violent crimes per 100,000 residents (St. Louis, Detroit, Flint and Oakland round out the top five, while New Haven and Hartford checked in at numbers 18 and 19 respectively). While Camden’s violent crime rates actually decreased slightly in most categories over the past year, little comfort can be taken as the city is currently considering laying off half of its 375 police officers in the coming year due to economic difficulties. Father Doyle again read the names, ages and causes of death of the murder victims. Rather than attempting to further explain, I decided to provide the list of people violently killed and challenge you not to skip over it, but to read each name. Can you imagine 38 people being murdered in the city where you live this year? Neither can I. The average age of the victims was 28. Five of those killed this past year were teenagers. Four out of the six people not killed by handguns, were female and died from severe beatings, strangulation and stabbings. I couldn’t help but think of a recent training I completed at work on domestic human trafficking and how girls coerced into prostitution have an average life expectancy of just seven years from the time they begin working. I did not become as emotional this time around, in part because I was attempting to watch Clara and Shepard throughout the Mass, both of whom did well but became antsy toward the end of the service. Upon thinking of the blessings of my wife and kids and the positive changes we have experienced over the past year, including the expectation of our third child in January 2011, I was re-energized in my goal to pray for Camden and for God’s healing of the city and ask for your prayers as well. The Fishers were not the only ones to experience blessings of change over the past year, as one couple from the Camden community welcomed their first child in the Spring and a couple from the Simple Way community in Philadelphia recently announced their engagement. It was a breath of fresh air to interact with the brothers and sisters in the communities and to experience their passion for God as well as their practical advice for ministering in an inner-city environment. In was encouraging to hear that despite the many difficulties that continue to face these families, that their young children have been an asset to their ministry, opening new avenues to other young parents and children in the neighborhood. But questions still remain and the work ahead has no end in sight. Camden was once a booming industrial town during World War II, but white flight and the loss of jobs handed down environmental disasters in superfund toxic waste sites, polluted air and contaminated water. The physical state of Camden is illustrated well by the following statement from a seventh grade Camden student immediately following 9/11, “I’m not afraid because if the terrorists fly over Camden, they’ll think they have done it already.” Can these young New Monastic families continue to raise their kids in such an environment? In a community with rampant handgun violence? Would I be willing to do the same if called by God to do so? These families do not claim to have all the answers, but do believe Camden is the type of place Jesus would hang out and so they stay, they work, they pray, they serve. And it’s a beautiful thing, this living the gospel out in all of its tension. They consistently claim Christ as Lord in their actions, not just their words and I find I cannot learn enough from them. Road trip anyone?